Where would you go if you could travel anywhere at all? Where would your sense of adventure lead you? Would it be around the world or around town? Perhaps it would have to be domestic. You could go to St. Louis and see the Gateway Arch and the mighty Mississippi River. You could go up river to Hannibal, Missouri and see Mark Twain’s home. From there you could head east to Springfield, Illinois and see Abe Lincoln’s wonderfully preserved home, maintained by the National Park Service. You might have one of the great wonders of North America in mind. So you could head north of Buffalo, New York to Niagara Falls and ride the Maid of the Mist right up to the Falls, or you could climb down the cliff to a point where the water falls between you and the land. On your way home you can stop in the Anchor Bar, home of Buffalo Chicken Wings. Yes, that’s the place that started what is now a full-blown food craze. If this does not suit your taste, perhaps you would run up to the northwest corner of Illinois and stop in Galena, the “town that history forgot.” You can walk through the mid 1800’s. You can stop at the spot of speeches by Abraham Lincoln (1856) and Stephen A. Douglas (1858), or visit the home of President U.S. Grant. At this time of year, you could travel down to the Mississippi River, just west of Galena and, with any luck at all, see the proud American Eagle. The very site of the bald eagle, waiting to come down from the cliffs to fish, will make the trip worth it. Although you may have to go further inland to the Great Plains during summer to see them. If none of these northern stops are what you desire, then perhaps you could fly to Orlando, Florida, take in amusement sites then drive to Tampa, Clearwater, Sarasota, down to Miami and onto the Keys. A stop in the Everglades means you can see alligators up close, REAL close. The Gulf Coast and the Atlantic Coast can be a playground. If Europe is your adventure you can fly to Frankfurt and go on to Stuttgart for museums and festivals. You can visit Strasbourg, France or cross the Rhine into Allemand (Germany). You can visit the magnificent ancient Notre Dame Cathédrale de Strasbourg or ancient castles of Alsace. There are vineyards and wine festivals and if you like, you can visit the Statue of Liberty in Colmar, France. It is in the middle of a busy traffic circle so you have to run fast and dodge the cars if you want to get over to it. If Germany or France are not on your list, how about London? It is one of the great international cities. In 1777, author Samuel Johnson, writer of an early English Dictionary, stated words that are still true, “when a man is tired of London, he is tired of life; for there is in London all that life can afford.” A few days or even a few weeks are not enough for the sights of London. Why do I bring up all these travel ideas? It is because I am thinking of a recent journey. Some of my friends may say, “Did you go there again?” I traveled to the northeast of France. It is the eighth year in a row my trip ended up there. In 2010 we made a trip to Stuttgart for an Oktoberfest type celebration, then on to France. 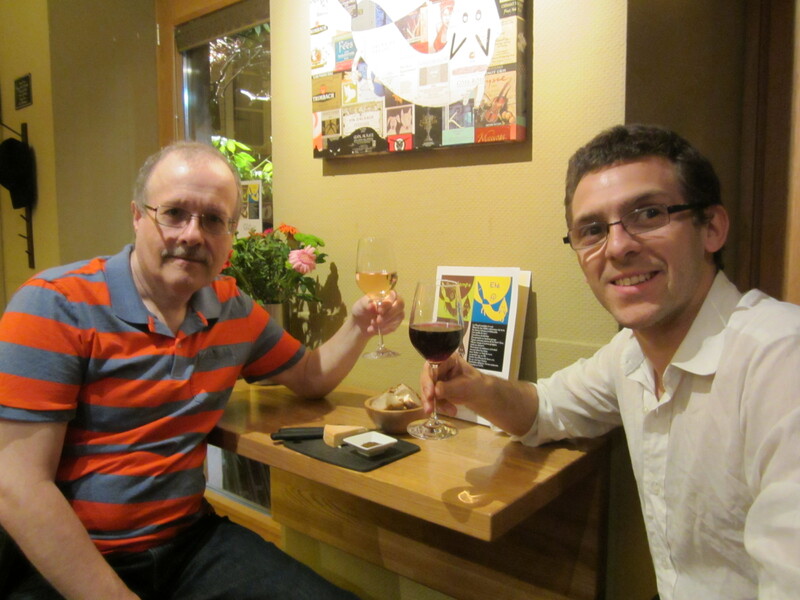 In the summer of 2013 I went with some friends to Paris, and then on to Strasbourg. In 2012 I met my friend in Baden-Baden, Germany so we could fly together to London for the Summer Olympics, then we went back to France. 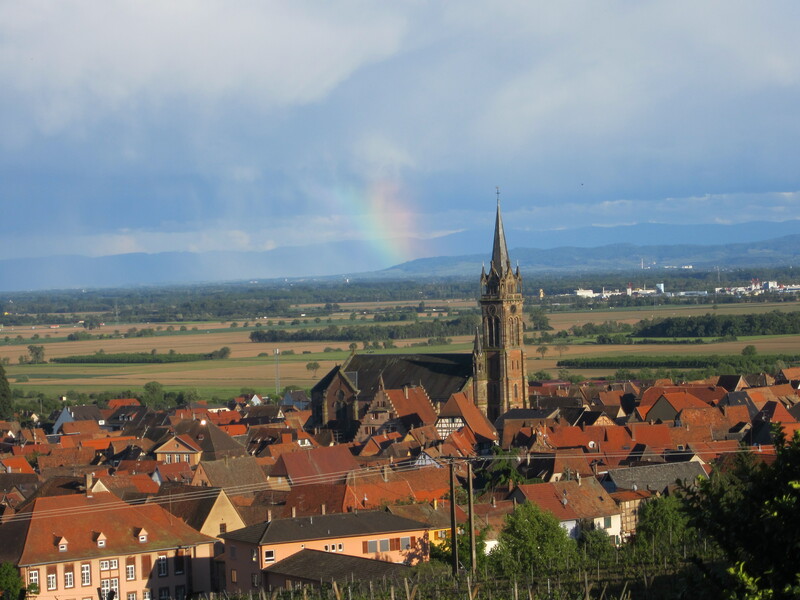 Last year I made it all the way to Selestat, France on my own. This year my friend met me in Strasbourg and we traveled on from there. These annual trips were all at different times of year. Some years my friend came to Chicago as well. For all of these travels we had some specific ideas in mind, but each time we did much of the trip spontaneously. When I reflect on these journeys, I realize there was no destination. I could have been going anywhere. We dreamed and we went, but it didn’t matter where. The ultimate destination was never a place. It was a friend. Yes, we visited new places and familiar locations. There are always new adventures, that’s for sure, but it doesn’t matter where we go. We enjoy our trips, large and small, because we are doing them together. Every stop is fun, every place is exciting, everywhere is new, even if we have been there before. It is because I am with a great friend. We have been together on all the adventures I have mentioned above. Of course, we often set off to see great sites or experience great things, but they were made special by the fact that we shared these adventures. So I will probably fly to Frankfurt again some day and take the bus on to Strasbourg. The final destination is friendship, the best destination of all. You’re right Rich, it’s the people who make a place important and enjoyable. It is nice to see famous sites, but as I get older, the people mean much more. Next week I will share some sites from my last trip to France. It was all about the people. Looking forward to it Rich. Travelling the off roads, away from the touristas (??) always the best way to see, meet and absorb. I still yearn to see the South Pacific, Australia and New Zealand. We love the back roads and small towns as well as the big tourist stops. We used to go to Martha’s Vineyard every summer. Same place. Same people. And it was always wonderful, a world out of time. I like both doing the same things over and over — and trying something new. The problem is usually not having money for both. Now, it’s not having money at all. I see the same people, but we try to add in something new each time. If money is a restriction, we might just prepare a different dish or try a new wine. As I contemplate my next great adventure, I look back at the vacation thoughts shared last year on SERENDIPITY. Be sure to hit “View original post” at the bottom to follow over to teepee12.com for the rest of the article.